Unseen in the West, the BRICS summit in Xianmen marks a new step in the development of this international institution. Zhao Minghao reports the three main objectives of the summit and the concept of “BRICS Plus”. The months-long Doklam border standoff between China and India has been peacefully resolved. The two sides are both founding members of BRICS and both hope to maintain unity among emerging economies. As Chinese President Xi Jinping once said, “The BRICS cooperation is an innovation, which transcends the old pattern of political and military alliance and pursues partnerships rather than alliances.” Furthermore, BRICS countries are expected to reach beyond differences in political systems and ideologies and seek win-win development instead of playing a zero-sum game. The first BRICS foreign ministers’ meeting was convened in September 2006, which marked the foundation of the BRICS mechanism. In the 10 years since then, BRICS has become an important international economic bloc representing some of the world’s key emerging economies and developing countries. In that time, BRICS member states have increased their share in the global economy from 12 percent to 23 percent, their trade has grown from 11 percent to 16 percent, and investment has increased from 7 percent to 12 percent. Most importantly, the contribution made by BRICS economies to global economic growth now stands at more than 50 percent. With the Trump administration’s “America First” policy in play, the global economy now faces the major risk of declining multilateralism. If both developed and emerging economies continue to turn more inward-looking and back away from coordinating their macro-economic policies, the flickering flame of global economic recovery could be snuffed out. In recent months, many economists including Managing Director of the International Monetary Fund (IMF) Christine Lagarde have stated that the global economy is finally showing positive momentum 10 years after the financial crisis. The US, Europe and Japan have witnessed steady growth and Russia, Brazil and South Africa have reportedly improved economic figures as well. China and India, meanwhile, have maintained medium to high economic growth rates. The BRICS Xiamen Summit aims to usher in the second golden decade of the mechanism. First, BRICS nations aim to set down new measures to boost trade in services, investment and e-commerce. In 2015, export of BRICS members’ trade in services reached about $540 billion, a mere 11.3 percent of the world’s total. With the middle classes expanding in BRICS countries, there is plenty of opportunity for cooperation in healthcare, tourism, education and other sectors. In addition to this, BRICS countries have been committed to implementing schemes to facilitate investment, including measures to improve efficiency in the administrative approval process and the openness of industries. The BRICS E-commerce Working Group was established in August to help develop small- and medium-sized e-commerce enterprises into the new driving force behind the bloc’s future economic and trade cooperation. Second, BRICS nations are looking to proactively promote the improvement of global governance. Apart from reform of existing international mechanisms such as the UN Security Council and the IMF, BRICS countries have already established cooperation mechanisms in anti-terrorism, space, cyber security, and energy security. As major energy exporters and consumers, BRICS countries will also deepen cooperation in increasing strategic energy reserves, developing renewable energy and enhancing energy efficiency. Third, BRICS member nations are looking to enhance cooperation on national and regional security hotspots. During the seventh Meeting of High Representatives for Security Issues in July, it was agreed that deeper political and security cooperation would be the key to strengthening the BRICS mechanism. The political situation in the Middle East and North Africa was the main focus of attention, while issues relating to Afghanistan were made on several occasions in the joint declaration . Most importantly, the Xiamen Summit put forward the concept of “BRICS Plus.” This places the focus on BRICS member countries to deepen relations with other developing countries to support and safeguard their interests, with the ultimate goal of expanding its international influence. 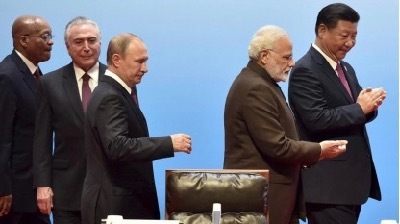 Talks between BRICS and African state leaders were arranged during the 2013 BRICS Summit in Durban, South Africa, while India invited leaders of countries that border the Bay of Bengal to the Goa Summit last year. This year, leaders of countries such as Mexico, Egypt and Tajikistan are attending the Xiamen Summit as part of the BRICS Plus initiative. There is no doubt that BRICS cooperation is not without its challenges. China, Russia and India need to better manage the negative impact of geopolitical factors between their countries, and help build a stronger collective identity for the economic bloc. BRICS also needs to focus on turning cooperation documents into real actions instead of dwelling on empty talk. It is estimated that by 2021, the BRICS New Development Bank will have made $32 billion in loans. The bank’s African office also started operations in South Africa in August. It is clear that such international mechanisms under the BRICS framework need to play a more complimentary role in global governance to a much greater extent in the future than they do now.